Purchase Michael Sieve Art Prints online from ArtBarbarians.com located in Minnesota. One of the best artists in the category of wildlife art is available from our large inventory, it's Michael Sieve. Like most people you probably can identify with nature like most of the artists we feature here on our web site or you can check out a video interview with the artist exclusively from Art Barbarians (30MB). We have a couple of examples of this fine artist's work. You get a sense of perspective in his art and an excellent color representation that is deep and rich. Michael Sieve is an avid sportsman and recognized wildlife and big game artist, he believes that the best wildlife art is inspired by actual experiences in the field. These real life experiences, coupled with extensive research on the natural history of the area and species, plus photographs and specimens where possible, enable an artist to create a successful painting which is both artistically interesting and naturally accurate. When not traveling in search of material, Michael resides in southeastern Minnesota's bluff country, a region blessed with stunning scenery and abundant wildlife where he can observe deer, coyotes, turkeys and grouse, all on a short walk from his front door. 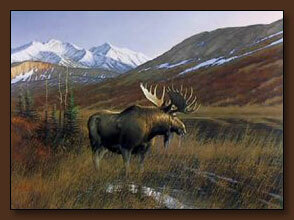 The moose on this page is a Michael Sieve art print called "Alaskan Classic - Moose". 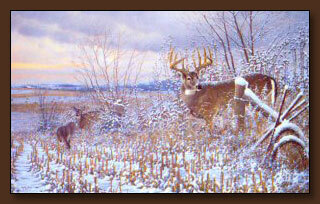 Another one of the great Michael Sieve art prints is the picture below which is titled "After The Storm - Whitetail Deer". This image gives the feeling of being in open fields after a winter snow storm. It looks so much like the Midwest and you can almost smell the fresh, cold air just as the subjects of this great print experience. You can see the stubble from the farm field and there is wonderful detail in the deer that gives it a realistic, weighty appearance. A distant farm is also captured and the feeling of open spaces can be enjoyed whether you have it hanging in a living room or other interior room. You can see from both pictures that this artist has a flexible sense of colors and enjoys creating vistas that is the larger environment of the animal subject. You may want to browse our wildlife prints and you'll find that our selection of paintings is one of the deepest on the Internet, with many artists listed here. We're adding new paintings and prints everyday, after that you may want to move onto our original paintings area which will give you an idea of the depth of the art we carry. It's exciting to be a part of an offering which brings people such a sense of satisfaction and joy. The colors, the depth, the natural settings, all of this makes this art we care about so special. We have many personal relationships with many of these artists that we exhibit and sell, and they trust us to portray their art in a correct manner. Those relationships give us the advantage of getting you some of the best new art first, so you can add to your collection before what you want is gone. Call us if you have any questions about anything you see on our web site or need to know more about Michael Sieve art prints. We're happy to answer your questions personally regarding availability or something special you're looking for.